When planning a cross-country motorcycle trip that left from central Pennsylvania, I wanted to kick off the 5-days we had to cross the Midwest to Boulder Colorado with a few days of fun riding before we hit the inevitable straight-aways of the high plains. By looking at the Curvature file for the states I’d be passing through it became clear that we’d have nothing but straight roads after eastern Ohio unless we dipped a bit south toward the Ohio river and crossed Northern Kentucky. The Midwest doesn’t have many hills until you get close to the Ohio river. 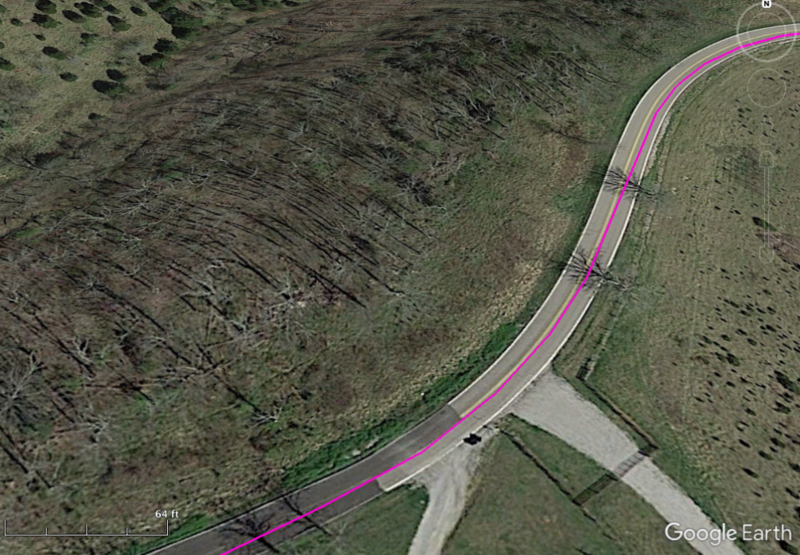 As I did with each section of the route, I zoomed into northern Kentucky to pick which roads I wanted to take. 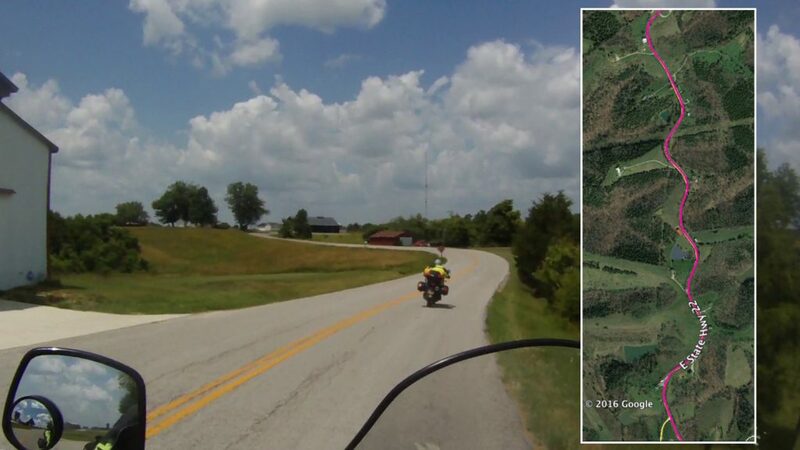 Since I was heading from east to west and didn’t want to detour too far south, I identified a few roads that looked promising: KY 10 and KY 22. Zooming in I find that KY-22 is just non-stop curves. 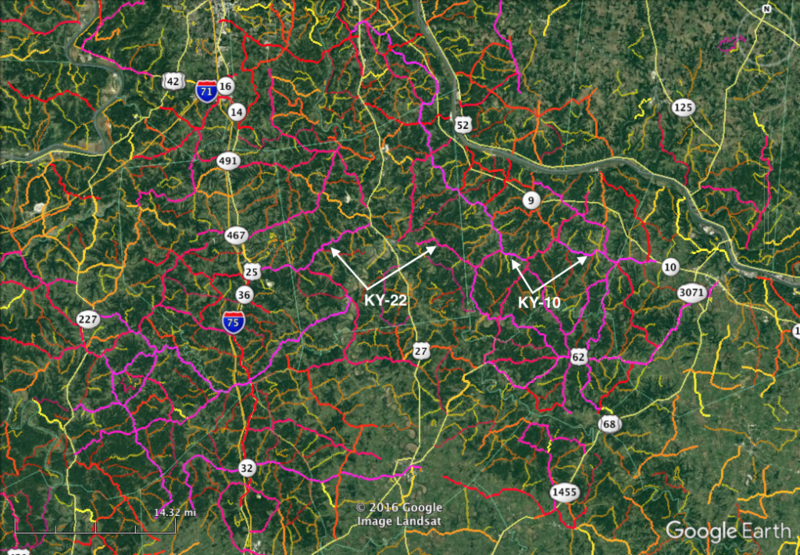 This western segment of KY-22 has almost 20 without significant straight-aways. 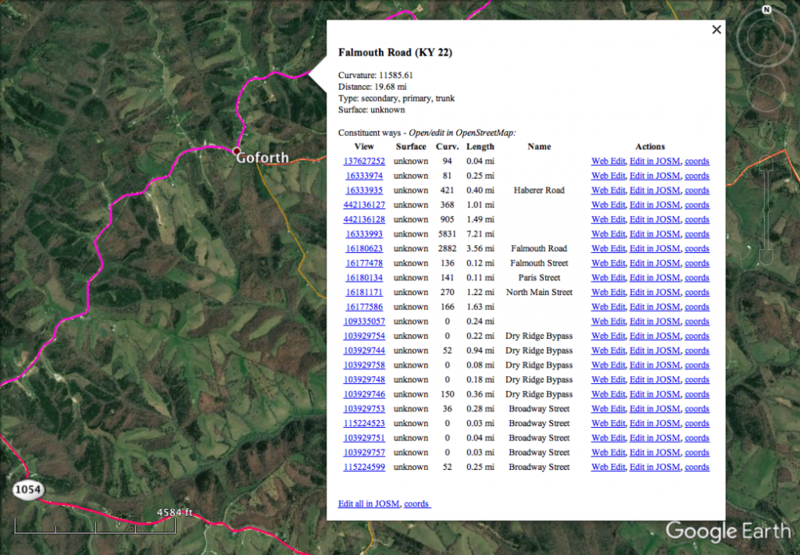 When zoomed way in, the satellite imagery in Google Earth is usually sufficient for confirming the road-surface. Having confirmed the surface wasn’t dirt I added highlighted it on my map and made some notes for later entry into my GPS. Later, during our second day of the trip we slogged through some traffic crossing the Ohio River into Kentucky and were uninspired by the first hour on the straight eastern part of KY 10. Once we passed Maysville however, the road headed up into the hills and started winding through the countryside. It usually stayed on the ridge tops, winding back and forth between farms and rarely dropping into the valleys. Kentucky’s fabulous Highway 22 winds for miles and miles along the tops of the rolling hills with nary a straight-away. Turn after linked-turn follows on, seemingly forever. For the the rest of our morning we snaked across this beautiful corner of Kentucky without seeing any more than a handful of other vehicles on the road. This rural route doesn’t really go anywhere directly but that made it all the more fun for us.